Zach Soprovich is a lawyer practicing in commercial litigation, debt recovery & foreclosures, and insolvency & restructuring law. He grew up on a farm an hour northeast of Edmonton. He received his Bachelor of Commerce (with distinction) from the University of Alberta in 2013 and his Juris Doctor from the University of Alberta in 2016. In 2014, he was a summer student at Duncan Craig. While in law school, Zach volunteered with Student Legal Services. Zach was called to the Alberta Bar in August 2017. He enjoys staying active and playing a variety of sports including hockey, golf, baseball, curling and tennis. 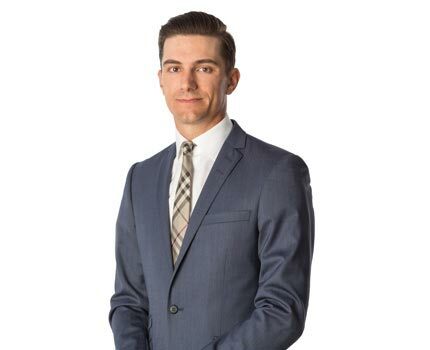 The partners at Duncan Craig LLP are pleased to announce Zach Soprovich has been called to the Alberta Bar. Zach started at Duncan Craig LLP in 2014 as a summer law student then returned in 2016 for his articles. He received his Bachelor of Commerce (with distinction) from the University of Alberta in 2013 and his Juris Doctor from the University of Alberta in 2016. Zach will be practicing in commercial litigation with a focus on foreclosures, collections, and insolvency. Duncan Craig LLP is pleased to welcome two new articling students to the firm: Zachary Soprovich and Shayla Stein. Zach grew up on a farm an hour northeast of Edmonton. He received his Bachelor of Commerce (with distinction) from the University of Alberta in 2013 and his Juris Doctor from the University of Alberta in 2016. In 2014, he was a summer law student at Duncan Craig. While in law school, Zach volunteered with Student Legal Services. He enjoys staying active and playing a variety of sports including hockey, golf, baseball, curling and tennis. Shayla received her Juris Doctor from Queen's University in 2016 and was on the Dean's List in 2014-2015. She has won numerous awards including the Lenczner Slaght LLP Advocacy in Moots Award, Best Overall Advocate at the Ontario Trial Lawyer's Association Cup and Best Team at the Ontario Trial Lawyer's Association Cup. While in law school she was the Associate Editor at Queen's Law Journal and was a student case worker at Queen's Legal Aid. Shayla likes to keep busy with Ultimate Frisbee, wall climbing and bouldering, and she has recently been trying to get into squash. Her hobbies include camping and hiking, reading books of all genres.